Making beef jerky has been on my list of things-to-try for quite some time. First, it's an interesting way to learn about a historic method of preserving meat. 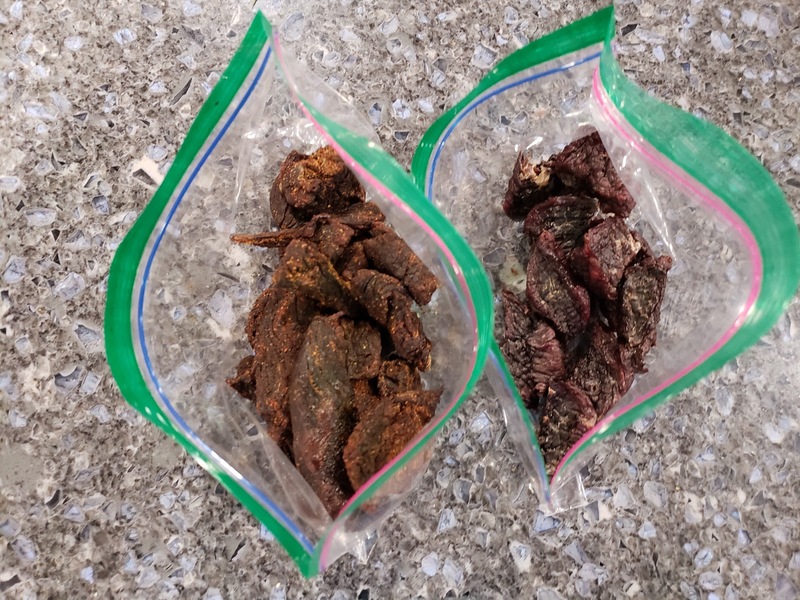 Second, there's the practical side: jerky should keep relatively well while backpacking, thereby opening new meal options on the trail. But I've always had an excuse as to why I couldn't try this project. I don't have access to the right cuts of (Kosher) meat. I don't have a proper dehydrator. I don't have the right drying racks. And on, and on. Looking at the Kosher meat section at Trader Joe's I decided, screw it, let's do this. Drying meat has been something our ancestors have been doing since recorded time. If they could make do with their primitive setup, I could too. So I bought two packages of meat: one a traditional looking steak and the other some stew meat. To really drive the point home, I split the sliced up meat into two piles. For the first pile, I simply sliced it and placed it on a parchment paper covered baking sheet. 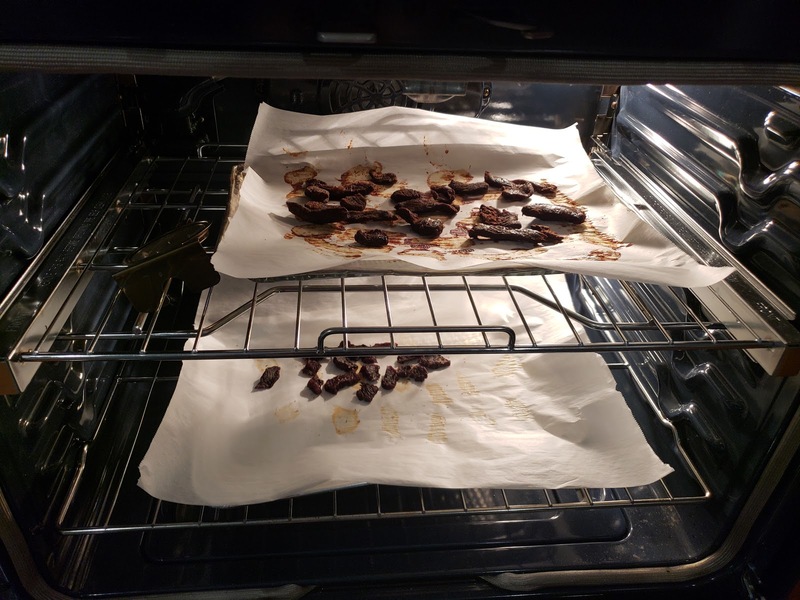 I put the baking sheet in the oven set to dehydrate and more or less forgot about it. I then crafted a marinade for the second pile of meat. I used this recipe, though half way through realized I didn't have any worcester sauce (a key ingredient!). So I improvised, tossing in a bit of A1 and some hot sauce for good measure. I put the sliced meat in a zip lock bag, added the marinade and put the bag in the fridge. 8 hours later, I took the meat which had been marinating and laid it out on more parchment paper. I then added this second baking sheet to the one that was already in the oven. The marinade free version of the meat tasted exactly like you expect it would: dry, tough and chewy. As part of regular snacking, I'd pass on it. But if it was on the menu after hours of backpacking in the woods, I'm sure I'd consider it gourmet. And besides it underscores my original point: preserving meat through drying isn't hard, you just need to do it. The marinade version, however, was surprisingly tasty. The flavor of the mystery marinade really came through and the pieces of meat weren't crazy tough. Given the choice of drying the meat, or marinading and drying the meat, the choice is obvious: marinade that sucker. Next time I'm near a fully stocked Kosher butcher, I plan to pick up the recommended flank steak/london broil beef. This really isn't a hard procedure to follow, and the results are both tasty and functional.